Proteas were unable to convert their success of fourth ODI in successive 5th ODI, which made India to clinch ongoing series. SA victory in the previous match speculated many that they will save the series, by equalling in this even series and with the return of AB, spectators assume it more firmly. India as a historic win over the rainbow nation made everyone proud. This was the first instance after 1992 when India won on the soil of rainbow nation. India had waited for more than two decades to win a bilateral, who can forget the 2003 World Cup that was held in proteas ground where India reached finals under the captaincy of Ganguly and defeated by Aussies. In Fact, in the 2009 Champions Trophy, Captain Cool team was eliminated before the knockout stage. Earlier in the past, 2013-2014 under the guise of Captain Dhoni South Africa outshined India by 0-2. Especially in 2010-2011 where men in blue gave the tough fight and reached close in the series by 2-3. After being defeated in the test series recently, fans started to be skeptical regarding India’s win in this ODI under the captaincy of flamboyant right-hand batsman Kohli. So far aggressive captain scored 393 runs with two centuries and not out twice by keeping India always on the upper hand which put Faf du Plessis’s men under psychological pressure which reflected in 5th ODI. In this whole series, Indian bowlers displayed a nice piece of the game especially spinners Yuzvendra Chahal and Kuldeep Yadav by taking most wickets and became highest oversea wicket-taker in bilateral tour against the rainbow nation. Before them, former West Indies all-rounder Keith Arthurton hold the record with 12 wickets taken across seven ODIs during the 1998-99 tour. In Port Elizabeth’s ODI in which India won by 73 runs, Chahal was the first who surpassed the record by taking in-form batsman David Miller. Kuldeep at end of the day took four wickets by giving 57 runs and now he leads the chart with 16 wickets. Prior to that, Anil Kumble holds the best record with five wickets in seven ODIs back in 1992-1993 tour to South Africa. 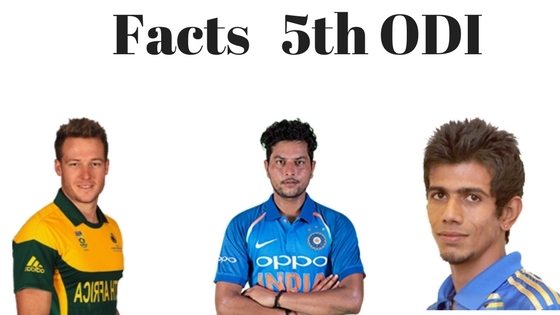 Soughting records of bowlers inclusive of pacers or spinners both Chahal and Kuldeep hold the highest record by surpassing earlier held by England’s Kabir Ali, who took 13 wickets in seven ODIs in 2004-05, and Australian Mitchell Johnson who took 13 in five matches in 2008-09. In 5th ODI the Hitman of India, Rohit Sharma gave a crushing word to critics by scoring a ton and during post-match interview he said about the partiality by media, also related to success and failure. But above that what took everyone attention is the run out record between a pair of captain and vice captain. This was the seventh incident when Kohli was runout due to misunderstanding during run up between the wickets and all the seven times Sharma shined. Twitters flocked with tweets about #Talent Sharma #Most pairs involved in run outs where Twitterati kept praising Sharma intelligence in sarcastic way. Now everyone eyed on 6th ODI and upcoming three match T20 series. Crix11.com prediction always stood on place in 5th ODI now for latest news tune into crix11.com.